Olive Garden Chicken and Shrimp Carbonara is a recipe that features the very familiar flavors of carbonara, but this recipe adds a unique touch of chicken tenders and shrimp for an update on this classic pasta dish. 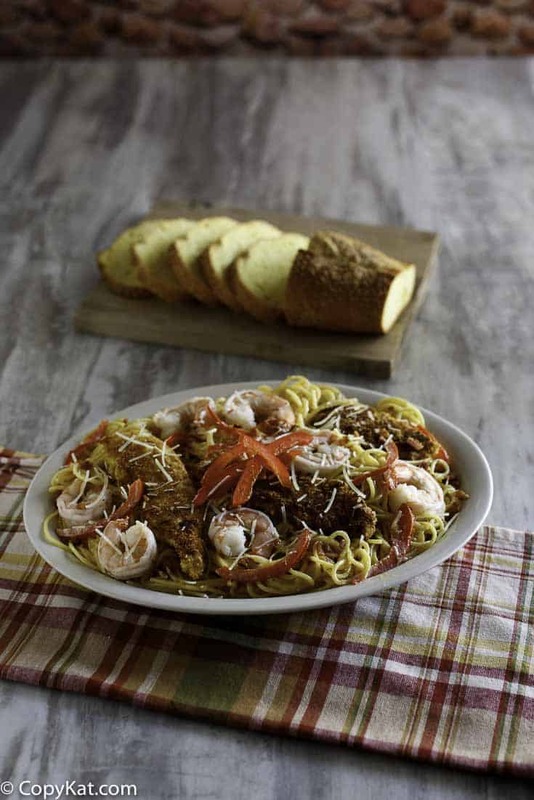 If you have been to the Olive Garden you may have found this new menu item, the chicken and shrimp carbonara is a new favorite of many people like yourself. 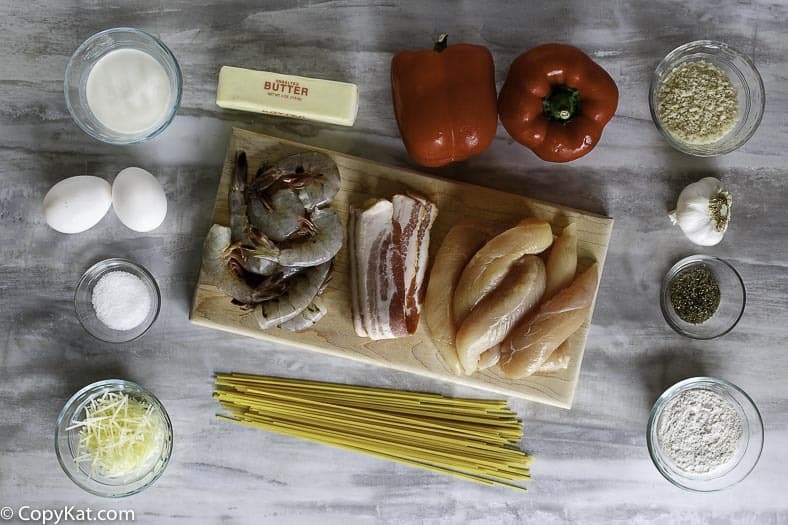 Sautéed seasoned chicken, shrimp and bucatini pasta tossed in a creamy carbonara sauce with bacon and roasted red peppers, is a dish you won’t want to miss. If you like Olive Garden Alfredo Sauce, you will enjoy this recipe. I have often made a quick dinner of Alfredo sauce and pasta, but this recipe turns this up just a notch. The pasta in this recipe is bucatini; bucatini is a hollow spaghetti. If you do not have bucatini available, you can use regular spaghetti. I like to use bucatini when I can it adds a unique texture to the pasta. I have found bucatini at Kroger; it is part of their Private Selections brand. Other ingredients in this recipe are heavy cream, Parmesan cheese, Romano cheese, lean bacon, red bell peppers, chicken, and shrimp. The chicken is first breaded and then sauteed in a pan. I lightly cook my shrimp and stir them into the sauce. The last step is this recipe requires you to place one beaten egg into the cooked pasta and sauce. The residual heat of the pasta will cook the egg. If this makes you concerned, you can buy eggs that are already pasteurized, a brand of these are Safest Choice that is sold in many grocery stores. You will want to stir the egg in quickly as you don’t want the eggs to curdle. The origin of this dish is originally a simple dish made of pasta, eggs, cheese, bacon or ham, and lots of black pepper. This recipe is slightly different it has a creamy Parmesan sauce. Other ingredients are also added, this has chicken, shrimp, and red peppers. So this dish is more hearty and slightly more updated. I think the additions are good and you will enjoy them in this copycat for the Olive Garden chicken and shrimp carbonara. Love copycat Olive Garden Recipes? 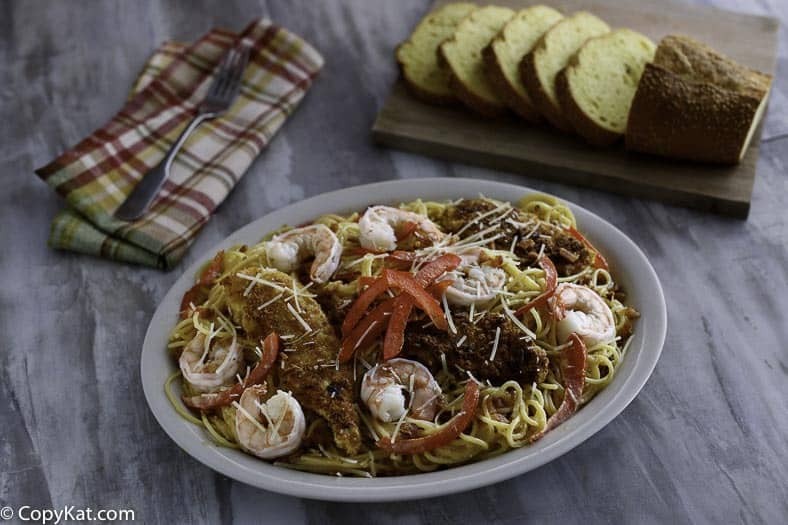 Be sure to try some of these Olive Garden menu items. Prepare chicken tenders by combining flour, Panko bread crumbs, salt, and pepper in a bowl. Mix breading until it is well blended. On another bowl combine 1 egg and 2 teaspoons water, stir until well mixed. Dip chicken in dry breading mix, then egg wash, and then back into the breading mix, and allow to dry on a rack. Allow the breaded chicken tenders to rest for about five minutes before cooking.Place 2 tablespoons of vegetable oil in a large skillet over medium heat. Add chicken fingers and cook for 5 to 7 minutes on each side, or until chicken is browned, and cooked through. Set the chicken to the side. Cook shrimp in a small pot in boiling water for about 2 to 3 minutes. Shrimp is done when it becomes pink.Cook pasta according to package directions.Prepare carbonara sauce by placing butter and lean bacon in a skillet. Cook over medium heat when the butter melts, add garlic and red bell pepper. Saute pepper, bacon, until the bacon is cooked through. Add heavy cream to skillet with Parmesan cheese. Stir until the cheese has been melted. When the cheese has melted add cooked pasta and remove from heat. Stir in 1 beaten egg, and stir quickly. The residual heat of the pasta and sauce will cook the egg.To serve place pasta and sauce on the plate. Add a few pieces of chicken tenders and shrimp to each serving. Garnish with additional cheese and pepper if desired. This recipe it’s absolute delicious. Me and my husband enjoyed it. I’ll be making it again. Great recipe! I doubled most of the ingredients and went heavy on the cream and cheese when I prepared the sauce. Overall, this recipe was a great success. I appreciate your time sharing this recipe!